It has been nearly a year since I wrote about the Old Police Cells Museum at Brighton Town Hall. Much has changed since then. The first building in Brighton that was called the Town Hall was a two storey building of 1727 on the site of what is today Bartholomew Square. It was used mainly as a workhouse and was demolished in 1823; several years before work on a replacement commenced. The foundation stone of the current Town Hall was laid in 1830 by Thomas Read Kemp, a very prominent local figure. He is of course the namesake of Kemp Town but was also a Member of Parliament, lord of the manor, a town commissioner, a magistrate, a philanthropist, a property developer and founder of a dissenting religious sect! There would have been ample room for the town commissioners when it was built but the Council’s offices are today spread all around Brighton & Hove. The Town Hall was designed by Thomas Cooper who was actually a town commissioner himself. Cooper also designed the Bedford Hotel of 1829 which was replaced by what is now the Holiday Inn following a fire in 1964. The Town Hall and the Bedford shared several common features such as Classical proportions and massive Ionic columns. 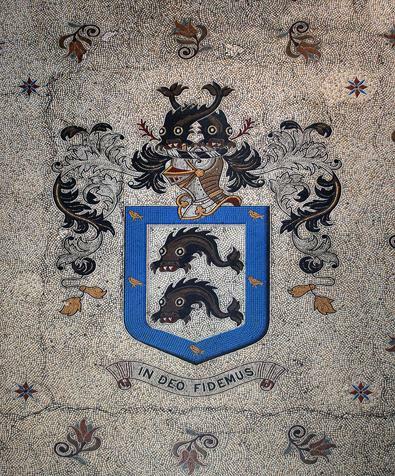 The interior of the Town Hall is a delight and its greatest assets are the intricate staircases and a mosaic of the coat of arms of Brighton. The building was Grade II Listed in 1971. Brighton Borough Police was formed in 1838 and moved straight into the basement of Brighton Town Hall. Their premises were enlarged in 1897-9 and a bicycle was purchased. Brighton’s first Chief Constable, Henry Solomon was killed in the Town Hall in 1844 by a carpet thief, John Lawrence, whom he was interviewing. Lawrence smashed Solomon’s skull with a poker that he grabbed from a fireplace and was hung soon afterwards. Brighton Police moved into the current John Street premises in 1965. Although Brighton and Hove were amalgamated in 1997, Brighton Town Hall and Hove Town Hall have both retained their names and are used for different purposes by Brighton & Hove City Council. Of the former cells in the basement (8 male and 5 female), the Old Police Cells Museum now incorporates 3 male and 5 female. The Museum now even has its own website: www.oldpolicecellsmuseum.org.uk. Check it out asap to book a visit.